Flynn’s Saudi Nuclear Deal; What do we know so far? Michael Flynn, the former head of the Defense Intelligence Agency (DIA) and briefly, the National Security Adviser to the President, is reported from 2015-2017 to have been engaged in an effort to sell 16 nuclear reactors to Saudi Arabia. The project did not succeed. Flynn’s efforts were first revealed in Newsweek in June 2017 by reporter Jeff Stein. Retired Lt. Gen. Michael Flynn made an unreported trip to the Middle East in 2015 to work on a U.S.-Russian venture in Saudi Arabia before he joined the Trump campaign, possibly having multiple contacts with Saudi officials that he also failed to disclose when seeking renewal of his security clearances. In December 2017, U.S. Rep. Elijah Cummings (D-MD) released documents, briefings, and emails collected by the House Oversight and Government Reform Committee. They provide extensive details about Flynn’s consulting work related to the proposed Saudi nuclear deal. Cummings says he was aided in his discovery of the documents by an unnamed whistle blower. Other news organizations including Reuters and the Washington Post have reported in-depth on Flynn’s marketing activities. Reuters reported on the relationship Flynn had with two beltway consulting firms. The Washington Post reported that the undisclosed trip could add to Flynn’s legal woes. The public interest news site ProPublica reported on the nonproliferation issues associated with the proposed deal. Flynn pleaded guilty on December 1, 2017, to lying to the F.B.I. about conversations he had in December 2016 with the Russian ambassador about U.S. sanctions. He has agreed to cooperate with the special counsel in the ongoing Russia investigation. Coverage of Flynn’s activities to sell 16 nuclear reactors to Saudi Arabia, with two different consulting firms, are reported in great detail in the news media reports cited in the summary. Yet, there are significant contradictions between what Flynn is reported by the media to have done and the elements of a successful nuclear deal. This blog post takes a look at the most significant of these contradictions and tries to put them in context. There are many other aspects to Flynn’s proposed nuclear deal having to do with U.S. sanctions on Russia and relationships with other countries including Ukraine. These are political questions that impact the proposed nuclear deal, but they are not dealt with here. The mainstream media continues to describe Flynn’s involvement in the Saudi nuclear deal as driven by greed. It isn’t clear that this was his sole motivation. What does appear to be true is that most of his wires for this project were crossed and shorted out before his plane ever took off from the U.S. to the Mideast in April 2015. At the top of the list of things that make no commercial sense is the fact that the Saudi energy ministry cancelled its plans for 16 full size (1000 MW) nuclear reactors four months (January 2015) before Flynn even started his project (April 2015). By the time Flynn arrived in Riyadh in April 2015 the 16 reactor project was stone cold dead. Whatever Flynn was doing in the Middle East in promoting nuclear energy, it appears from the news media coverage that he was a day late and a dollar short. Did Flynn not know that the Saudi energy ministry had walked away from nuclear energy? What made him think that by bringing a team of high powered door openers that they would change their mind? The iron imperative of needing enough oil revenue to pay for it, and not having it, was and remains the determining factor. It has only been since October 2017 that the Saudi energy ministry put its toe back in the water with an RFI for just two reactors. The document released to potential bidders references a power rating that matches the four South Korean reactors being built for the UAE. If the Saudi energy ministry sticks to that specification, it could knock out competition from Russia and China both of which currently offer 1000 MW units for export. (1) Due to drastic drop in price of oil, below $60/bbl, they could not afford $80 billion in spending over the next 10-15 years. They needed $100/bbl sustained over that period to afford the project, Note that the Saudis shot themselves in the foot by contributing to this price point. The price of oil has remained around $60/bbl since January 2015. (2) There are major supply chain issues for a project involving 16 1000 MW nuclear reactors including an inability to source from the U.S. due to long standing policy differences over a 1-2-3 agreement under the Atomic Energy Act. The Saudi government wants to enrich uranium, but the U.S. has said no, at least for now. 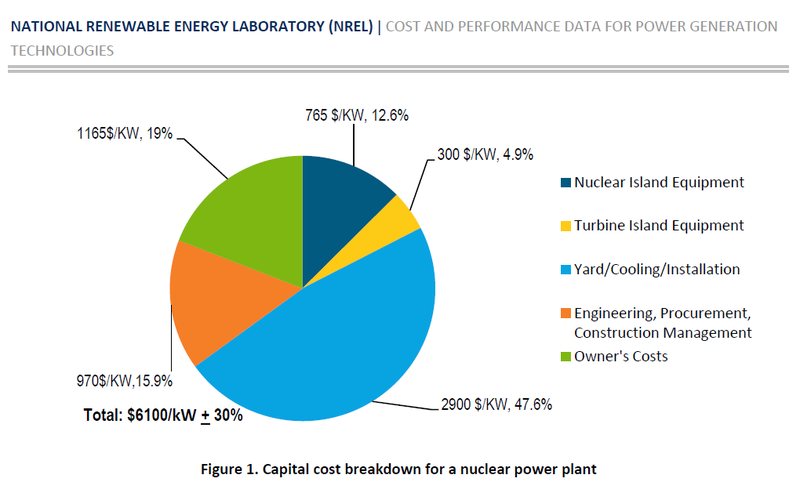 Black & Veatch in a recent report for the Department of Energy National Renewable Laboratory (NREL) estimated that the cost of the turbine for a 1000 MW nuclear reactors ( same size as a Rosatom VVER ) is $300/KW with a total cost of $6,100/KW for the entire installation plus or minus 30 percent. Yet, ACU’s emails reported by Reuters produced significantly different cost estimates for the turbines and the reactors. (3) There is not a mature domestic regulatory agency in Saudi Arabia capable of supervising safety during construction, or future operation, of 16 full size reactors. Plus getting a workforce to show up in the desert kingdom to build them would also be a major challenge. The Saudi energy ministry chose three widely separated coastal sites for the 16 reactor plan making work force integration and supply chain management an especially difficult set of issues. (4) Even if the Saudi government decided not to get any nuclear reactor components, and fuel for the reactors, from the U.S (Russia, China, and South Korea are available), they still don’t, at this time, have the management capacity to build two nuclear reactors much less 16 of them. All of this expertise would have to be brought in by contractors. Perhaps another plausible reason for a lack of involvement by U.S. firms is that Saudi Arabia does not have a 1-2-3 Agreement with the U.S. The lack of such a bilateral agreement prevents a U.S. firm like Westinghouse from doing business there. It remains unlikely that the U.S. would waive the restriction on uranium enrichment for Saudi Arabia having put the Iran nuclear deal in place and having imposed that same limitation on the United Arab Emirates which is building four commercial nuclear reactors supplied by South Korea. BTW: South Korea’s 1-2-3 agreement with the U.S. also has a restriction on uranium enrichment. 1. Where’s Westinghouse in the mix? While Flynn said that in congressional testimony he wanted to promote American nuclear technology in Saudi Arabia, everything he did there, if it had turned out to be successful, would produced exactly the opposite outcome and that is to enhance either Russian or Chinese market shares in that country. This is one of the major contradictions of Flynn’s activities. ACU, the first consulting firm Flynn was working with, would have brought in Rosatom, the Russian nuclear energy export group, to build the 16 reactors as VVERs. IP3, the second firm, would have brought in the CNNC and CGN the two major Chinese state owned nuclear firms to build the new export model, the Hualong One, which is slated also to be built for the UK. Neither consulting firm Flynn worked with ever mentioned promoting Westinghouse, in any significant way, which the one U.S. nuclear company that would have been capable of entering that market. Worse for U.S. export interests, Westinghouse declared bankruptcy earlier in 2017 after the South Carolina utilities behind V C Summer commercial nuclear reactor project cancelled it. 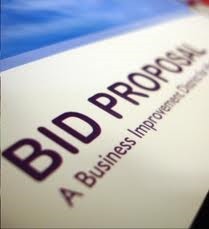 The root cause of the decision to cancel that project was poor project management. These facts might have been red flags for ACU and the Saudi energy ministry regarding a nuclear export deal with Westinghouse. ACU claimed that it could address fears about nuclear proliferation by deployed a “proliferation resistant” LWR. Another contradiction is that despite ACU’s claims, Russia does not have a “proliferation resistant” nuclear reactor for export. 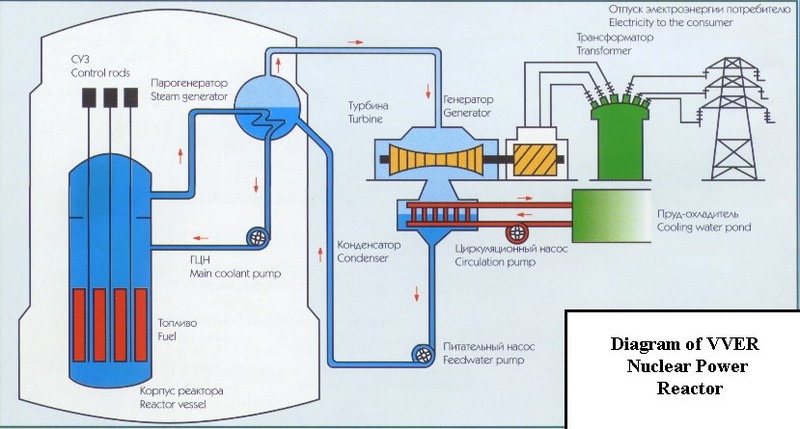 There is no such thing when it comes to “light water reactors” like the Russian 1000 MW VVER which is what they offer to export customers. This claim of “proliferation resistance” was made by an associate of Flynn’s named Reuben Sorensen who wrote about the concept in terms of control of PU-239 in the burn-up of nuclear fuel in a LWR in his PhD thesis at University of Michigan in 2006. He later worked at the Pentagon on nonproliferation issues during Obama administration. Reuters reported (citation URL at top) that “on November 18, 2016, 10 days after Trump won the presidential election, ACU’s Alex Copson received an email from nuclear non-proliferation expert Reuben Sorensen saying that he had updated Flynn on the nuclear project’s status.” His role in the project remains unclear as does the nature of his relationship with Flynn. In terms of preventing diversion of spent nuclear fuel to rogue reprocessing, what Rosatom, the Russian export agency, does do as standard practice is to take back the spent fuel from its customers, and turn some of it into an advanced nuclear fuel called MOX. This prevents diversion of the spent fuel by customers, but there is no advanced technology involved in shipping the spent fuel back to Russia once it has cooled off enough to handle in a dry cask, which takes about five years. Areva/EDF, the French state owned nuclear firm, does the same thing with its customers. About 30 reactors worldwide have safely used MOX fuel for decades. In terms of getting the attention of Egypt and Jordan, which was on Flynn’s agenda, the Russians made significant inroads with Egypt and Jordan back in 2014 and neither nation is likely to deal with U.S. reactor vendors for the simple reason that Rosatom promised both countries to provide 50% of the financing. No U.S. firm was ever going to do that. Egypt has since committed to have Rosatom build two reactors, the 1000 MW VVERs, but raising the money for the half, and doing the other things a customer in Egypt’s shoes needs to do remain a question. Reuters reports that a deal is expected to be formally signed in an upcoming visit of Russia’s President Vladimir Putin to Egypt. Significantly, Rosatom is offering Egypt its latest version of the VVER, a 1200 MW design, and plans to build four of them in that country. Jordan signed an agreement in principle for two 1000 MW Russian reactors, but never had the money for its 50% share nor the domestic political commitment to close the deal. Since then Jordan has shown interest in small modular reactors from other vendors. They are Rolls Royce from the UK for water cooled design and X-Energy from Greenbelt, MD, which has a helium cooled reactor design. Jordan is very interested in the affordability of the small gas cooled design since the country doesn’t have a lot of water to spare, much less for two giant 1000 MW water cooled reactors from Russia. It isn’t possible to draw a conclusion out of all of these contradictions about what Flynn knew, or did not know, as part of his dealings with two consulting firms. The facts are that the deal was a few beers short of a six pack whether Flynn knew it or not. What we find out is that Ratchett is really John Cassetti who kidnapped the (fictional) Armstrong baby (based on the Lindbergh kidnapping) and caused her death. The real story is that just about everyone in 1st Class took part in the murder. The local police accept the plausible story from Poirot about the bandits and move on. See the 1974 movie version for the best dramatic presentation of the story. In the case of Flynn’s nuclear deal, the desire to make a lot of money may be a motivation, and a label of “greed” is one easily accepted by the public reading multiple media reports about it. It is an “inside the beltway” story thatr doesn’t affect major consumer markets or lifestyles. Whether that’s the only reason for Flynn’s tenacious attachment to the complex project remains to be seen. The politics of lifting Russian sanctions as part of the Saudi nuclear deal remain murky. There’s a lot more that may come out as part of Flynn’s plea deal with the Special Prosecutor. Until that happens we’re left with a lot of unanswered questions. Postscript: For a nonproliferation perspective see also Lawfare” Why Flynn’s Nuclear Advocacy Was So Dangerous,” 12/13/17. 2 Responses to Flynn’s Saudi Nuclear Deal; What do we know so far?